Cavan were made to pay for a series of second-half wides as they were edged out by Roscommon in an entertaining Division Three Football League Final. The Breffni County led 0-7 to 0-2 and also had a Martin Dunne penalty saved but David Keenan's goal before the break cut Cavan's lead to only a point. After a tight third quarter, Cavan looked to be regaining control before they were undone by poor shooting. Roscommon's greater accuracy helped them move three ahead and they held on. The Rossies struggled with their shooting early on as Gearoid McKiernan and Niall McDermott kicked opening points for Terry Hyland's side. Cavan were then awarded a penalty after McKiernan was upended by Cathal Cregg as he was about to shoot for goal. Cregg was possibly fortunate not to receive a black card for the tackle although it was more mistimed than blatantly cynical. To compound Breffni frustration, Dunne's low shot was pushed out for a 45 by Roscommon keeper Darren O'Malley although the impressive Martin Reilly did point the subsequent place kick. As Cavan continued to dominate, James McEnroe was among the scorers as they led 0-6 to 0-1 and 0-7 to 0-2. However, Roscommon responded with three unanswered points which started with a controversial 45 kicked by Donie Shine, which had been awarded after a clear wide. Cavan appeared to have regrouped well with points from Eugene Keating and Dunne but the Rossies struck a crucial blow moments before the interval as Keenan was allowed to charge straight into the heart of the Breffni defence and loop a left-footed shoot over Conor Gilsenan and into the net. Helped by the breeze, Roscommon moved into the lead for the first time after the restart following two points from Senan Kilbride. Cavan were back in the lead by the 43rd minute as corner-back Fergal Flanagan strode upfield to slot a fine point. However, Kilbride levelled two minutes later and Cavan didn't lead at any stage of the remaining 27 minutes of action. They did draw level by the 57th as points from Keating and Cian Mackey left the score at 0-15 to 1-12 but Dunne, McDermott and Mackey were all guilty of firing bad wides as Cavan failed to make 10 minutes of superiority count. After lifting the siege, Roscommon broke downfield to score two quick points as Kilbride's 62nd-minute point was followed by centre half-back Niall Daly's second score of the game. 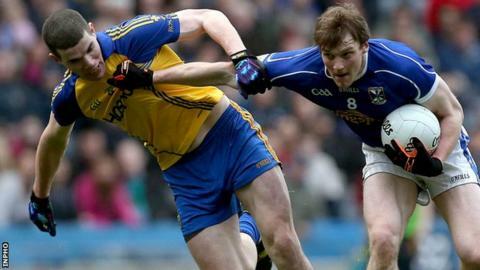 Dunne wasted Cavan's big chance to get back into the game three minutes from time when he blasted over from 14 yards after Roscommon full-back Niall Carty appeared to have been denied a blatant free. Roscommon's bench then came to the fore as Finbarr Cregg's fisted effort was followed by a glorious score from Colm Compton. Three down, only a goal was going to save Cavan which made McDermott's decision to kick a point in the second minute of injury-time all the more baffling. There was still time for one more play but Roscommon averted the danger to seal a win which was greeted with some joy by their much-travelled manager John Evans. Cavan: C Gilsenan, J Hayes, R Dunne, F Flanagan, J McEnroe, A Clarke, D O'Reilly, G McKiernan, K Brady, C Mackey, N McDermott, M Reilly, J Brady, M Dunne, E Keating. Roscommon: D O'Malley; S McDermott, N Carty, N Collins; D Keenan, N Daly, C Cafferkey, C Shine, K Higgins; D O'Gara, D Shine, D Donnelly; S Kilbride, C Gregg, C Murtagh.